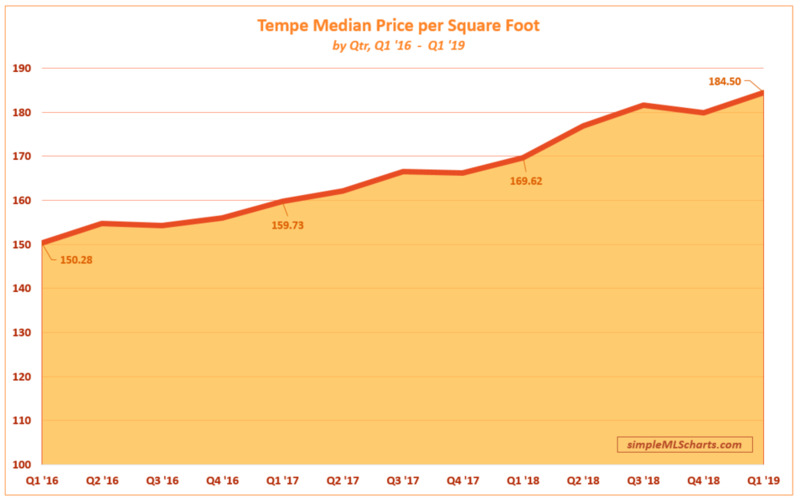 The chart shows Tempe’s price per square foot has risen consistently over the last few years, with most of the growth coming in the 1st and 2nd quarters, while the 3rd and 4th quarters tend to level out. 1st Quarter 2019 had a median $184.50 / sqft, 8.9% higher than last year’s median $169.62. Simple MLS Charts is supported by readers like you. If you find these charts useful, please consider becoming a patron with a small monthly pledge on Patreon. * All chart data represents single-family detached homes only. Information is believed accurate but not guaranteed. All the charts and information you find here is free, but they do cost time, effort, and money to produce. Please consider a small monthly donation if you find this information helpful.